Earning a featured spot in the revamped iOS App Store can increase app downloads by up to 800 percent, according to new data sourced from app analytics site Sensor Tower and shared by TechCrunch. 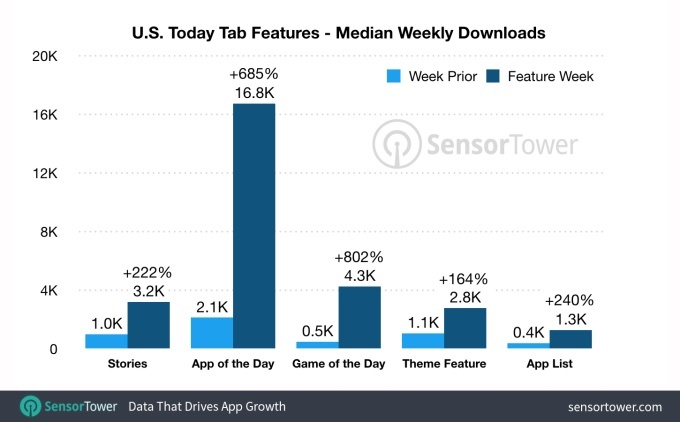 The data, collected from September 2017 to the present, suggests an app that's highlighted using either the "App of the Day" or "Game of the Day" feature in the U.S. sees the greatest increase in downloads. Specifically, "Game of the Day" apps have seen a median download increase of 802 percent for the week following the feature, while "App of the Day" apps have seen a boost of 685 percent. Other features, such as a developer story or an app list can increase downloads by up to 240 percent. Stories resulted in a 222 percent boost in downloads, while app lists increased downloads by 240 percent. A theme feature had the lowest impact at a 164 percent increase in downloads. Sensor Tower has also outlined what kind of data Apple has chosen to highlight through the new App Store design. 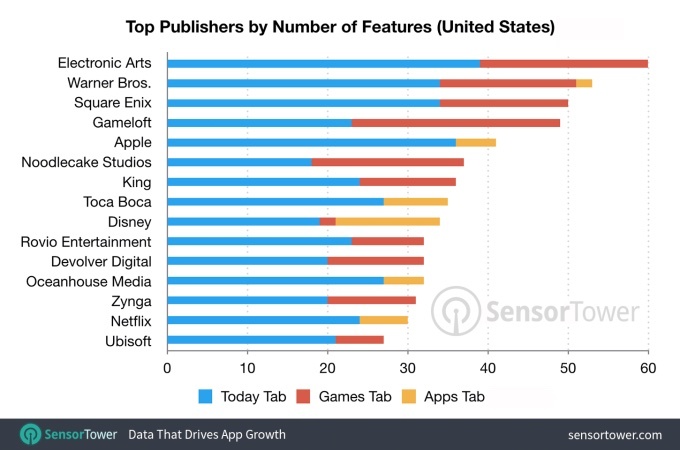 Many of the top publishers that have been featured are larger companies, like Electronic Arts, Warner Bros., Square Enix, Gameloft, Noodlecake Studios, and King, which is unsurprising as these companies have put out some of the most popular apps in the App Store. 13 of the top 15 featured publishers had at least one million U.S. iPhone downloads since the launch of the new App Store. Apple has, however, also focused on highlighting indie apps. 29 percent of apps featured since the launch of the new App Store have been from publishers who had fewer than 10,000 downloads at the time. "While it's clearly the case that big publishers are more likely to receive the largest number of features, small publishers still very much have their chance to benefit from a feature on the App Store," said Sensor Tower's Mobile Insights Analyst, Jonathan Briskman. Apple introduced the redesigned App Store in iOS 11 to offer additional opportunities for exposure to app developers. The new App Store includes a "Today" section that's updated daily with app suggestions, featured spots, app lists, developer features, and more, and it splits apps and games into two distinct categories. 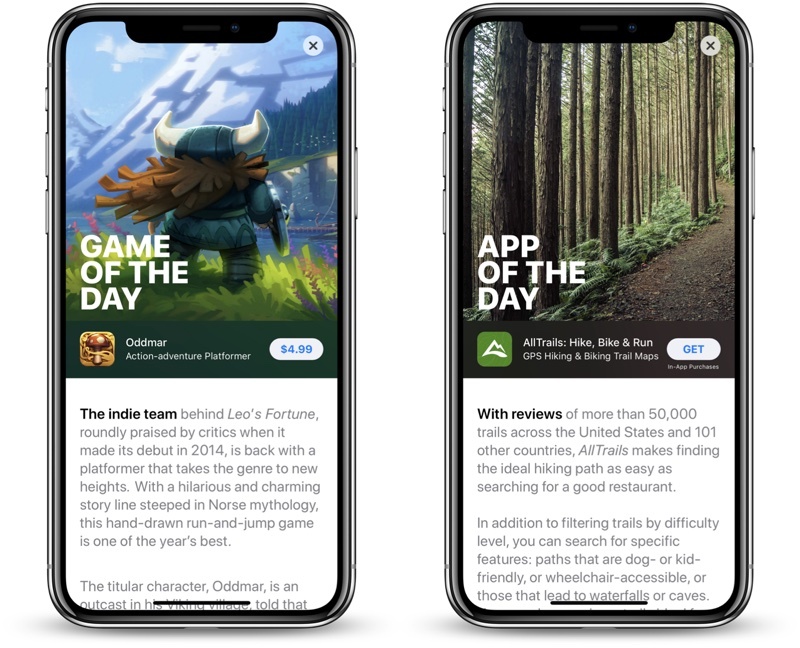 Content featured in the new App Store is chosen and curated by Apple's App Store editorial team, which ensures high-quality recommendations that don't rely solely on popularity rankings. As noted by TechCrunch, Sensor Tower's data suggests that Apple's goal of increasing developer exposure through the new App Store design has largely been a successful venture. 2.) that the iOS App Store is still catastrophically broken ... especially their Rankings algorithm ! Users should be able to Discovery apps they are interested in "On Their Own," NOT via Apple's decisions !!! Users should have control options for filtering apps, based-upon their own criteria ... e.g., Rank apps ONLY via new Ratings within the past 1-2 weeks. It's NOT Rocket Science, but for whatever Reason, Apple refuses to fix the problems ! ... and they are very easily fixed. I don’t pay attention to the featured apps. Or anything that comes up on the opening page. If I’m in the App Store, it’s because I need something. I don’t just browse to see what’s there. I’m only there if I have a need for something, and then I’m straight into the search tool. In the early days when I was curious what there was (talking way early days in the first few years of iPhones)... I used to go browse by category and free within categories. But honestly, these days I find apps to be mostly unnecessary. Of course there are my daily use apps for email, internet, and messages. But beyond that, I find that most apps are recreational. And I don’t use my phone for games. And, I don’t care to spend money on things that I don’t need. So an app has to be absolutely necessary to accomplish a task that I need, before I’ll even start looking for it. Genuinely curious -- do most people download new apps these days? I rarely do. And if so, it'll be an app that I search for directly. I remember seeing a stat about a year ago that showed that most people (it was like 80% or something) use the same ~8 or so apps. Put a link to your app in your signature. Reason is Search Ads. . Apple can make more money now. App Store Search Algorithm is broken. . You can't find an app by its name. .
Main problem is the way they rank..
Take for example my app named "Custom Notch" which is paid. Initially it is the only app with that name. So if you search you would find that app easily. Then comes copycats who offer it for free with loads of ads and keyword optimisers who use that name in their keyword just to get discovered. 1000s of people come searching for the app "Custom Notch" the app becomes popular by word of mouth. Most of them will see your app and skip and will download free copycat apps. Then they will delete it. But App Store algorithm will think since lot of people are not interested in the your app it will decrease the app ranking for your app and increase the ranking for the other apps. So your app will go down. Then downloads will go down. Rank will go down again. Copycats and crap apps will come app in the search. . Your app will be hidden deep among Millions of apps. .
How times change :) my partner used to run a games business. I helped back in the day with artwork and testing.... it was a real homebrew business! It was quite successful around 2000-2013 and it’s kinda amazing how different things are these days. Back then for example all you had to do was release a good game.... now you need to work with streamers and other new marketing things, you need to petition store operators to put your wares on the front page.... in a way it’s worse as it’s just more things to consider. More barriers to entry. I don’t envy new developers. It just looks so difficult to make big bucks with it these days. Personally I feel the quality of games has dropped significantly. I don’t play them much any more because they’re just relying on single addictive hooks. There are hardly any stories. Too many irritating and greedy mechanisms like free to play, adverts in paid games, paid games being removed from the store. You just don’t get that with Sony or Nintendo. The content you paid for is still available...... still works. There’s the Nintendo Switch which still offers quality gaming but I dunno how long that will last as floodware seems to be appearing on it. Have you even played Mario Odyssey or Breath of the Wild they’re both perfect video games!! …or it's simply that more than 2,000,000 apps on the App Store, of which many are barely distinguishable or blatant rip-offs of other apps, are just too many to just discover interesting apps "on your own".